The Dutch newspaper “Algemeen Dagblad” (AD) will issue a book with highlights of 30 years André Rieu. This 100 page booklet is filled with pictures and is accompanied by a DVD with never released material. The introduction is written by Ivo Niehe. A familiar name for those who follow this site. The book is written in Dutch, there will be no English version. 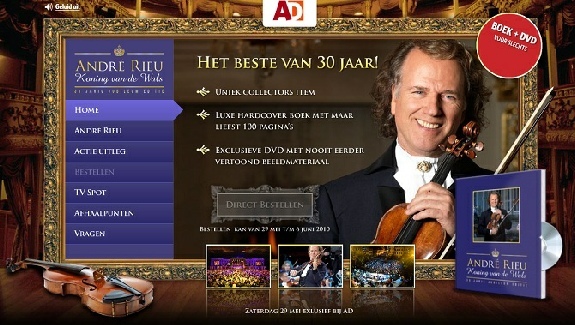 Ordering can only be done through the website of the newspaper, http://rieu.ad.nl/AndreRieu/ and is limited to shipment within The Netherlands. We have now terminated the possibility to order this book via this website. In total 83 books have been ordered. We now have to wait till August 18, 2010. At that date the books will be available and I hope to ship them one or two days later. We will notify everyone when the books will be send.